In the early 1800s, planters from Kentucky, Tennessee, and Virginia sought the rich river soils of the Delta to grow cotton. They brought enslaved laborers to clear the dense forests and build homes of unique architectural styles. Dr. Jonathan Martin Taylor and his wife Mary Elizabeth Robertson invested in land after their marriage, establishing Mauvilla in Kentucky and Hollywood Plantation along Bayou Bartholomew in Arkansas. Hollywood—a 10,000 acre plantation with 83 enslaved laborers prior to the Civil War—was occupied until the 1940s. 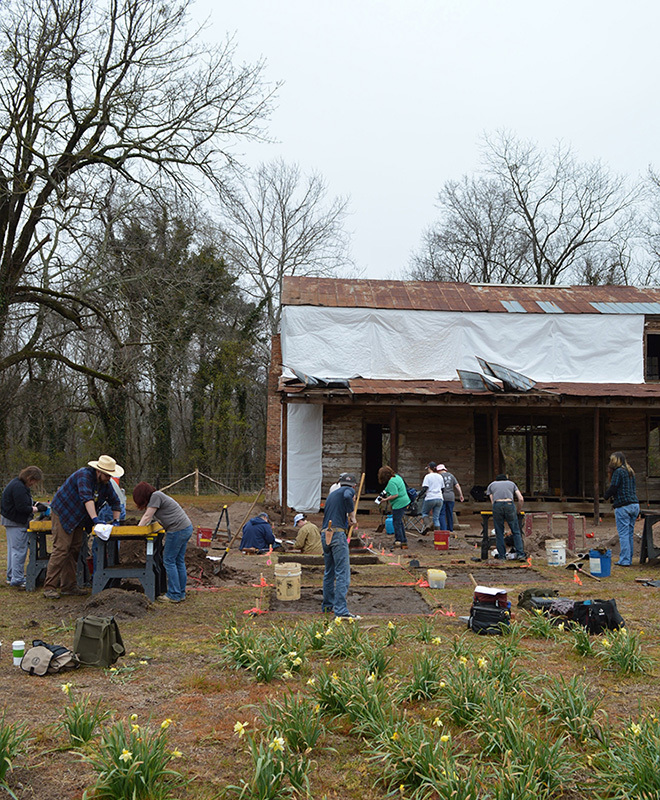 The UAM Research Station is conducting archeological research at the plantation in Drew County to aid architects and historians in the restoration of the two-story, dogtrot style, cypress-log house, currently being restored by the University of Arkansas at Monticello. The house, which features the classic dogtrot floor plan, with the central open passageway flanked by two single pens, was listed on the National Register of Historic Places in 1995 because it was the “best known example in Arkansas’s lower Delta region.” The Taylor House project, which has been supported by Arkansas Natural and Cultural Resources Council grants, seeks to restore the house to its 1840s and 1880s conditions. Dr. Emily Beahm and Devin Pettigrew mapping a unit profile. The excavation units follow the south wall of the cellar, which is 8 meters or 26 feet wide. Behind the scenes of Hollywood: Science and problem solving at Hollywood Plantation is an activity book written for students 13 and up. 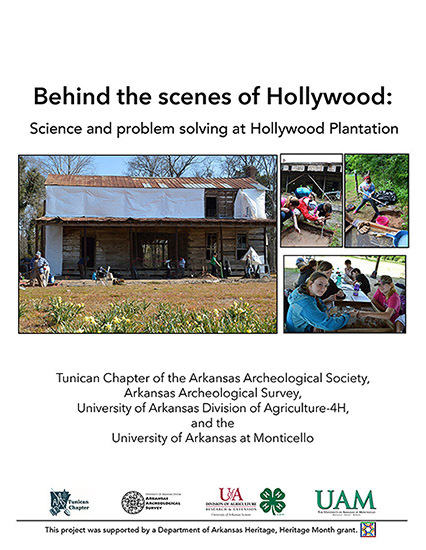 Published by the Tunican chapter of the Arkansas Archeological Society and the UAM research station, this book includes an overview of archeology and hands on activities to get you thinking like an archeologist. To request a copy of the book or to schedule a public program, contact the UAM research station. Archeological research began in 1991 with Dr. Leslie “Skip” Stewart-Abernathy, along with Arkansas Archeological Society volunteers, conducting excavations, oral history interviews, and a dendrochronological study. The research (1) confirmed that the house had been moved from its original location sometime in the early 1880s, (2) located a wall of the cellar, and (3) determined that the house had been the focus of extensive renovations. More recently, the University of Arkansas in Monticello developed a master plan for the restoration of the house. The restoration work is ongoing and part of the master plan includes archeology and geophysics. 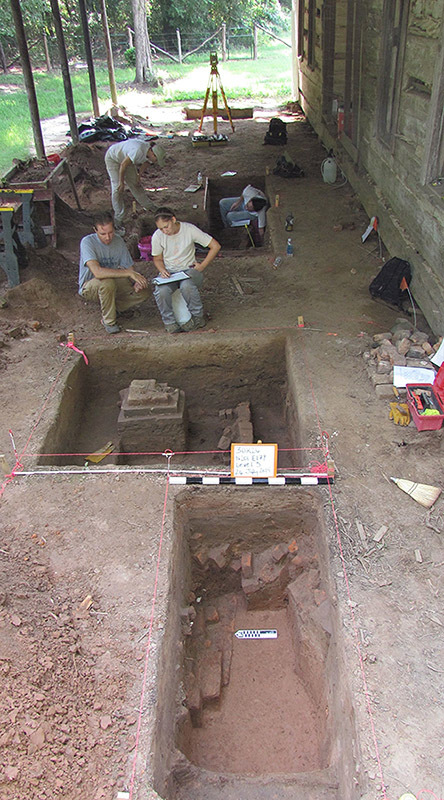 Recently, archeology and geophysics were conducted to identify the piers of the front and back porches, the ell kitchen, the cellar, and the outbuildings. The 2014 archeology located the kitchen, the cellar, and porch piers and the results are being used in the current renovations of the house. 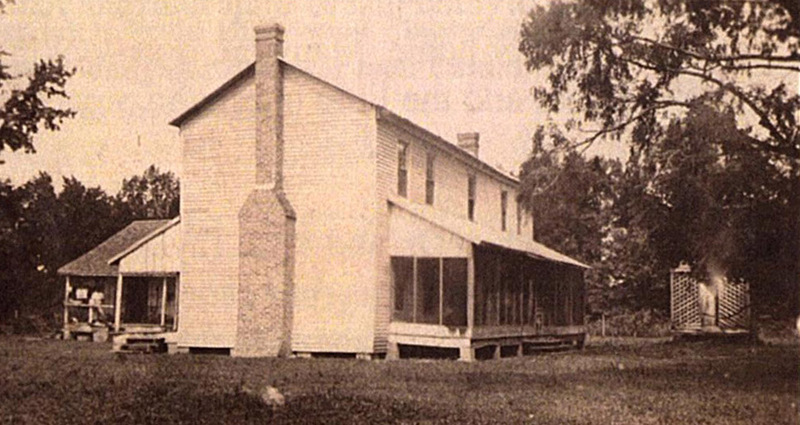 The thousands of artifacts—which include medicine bottle fragments, a porcelain doll head, a thread spool, faunal remains, ceramics, nails, and more—combined with primary sources, will help archeologists learn more about landscape change, foodways, health, and the everyday lives of the people who lived and worked at Hollywood Plantation. Archeologists and volunteers excavating the ell kitchen spring 2014.